I've always had a thing for creepy houses, and I was immediately drawn in by the cover on this one. At the outset of the book, a young boy wakes up from a bad dream and wets his bed. His father is angry at being woken up and sends the boy down into the basement and locks him in. The story then moves forward to the present, with Peter and Hannah moving to his hometown because of his father's declining health. His parents' main home is to be cleaned up and sold to help pay for his father's living expenses in the personal care home, but his father had bought a secondary residence which is where Peter and Hannah will be living. They fix up the house and Peter, who is an audiobook narrator, sets up his recording booth in the basement. Here is where the book gets weird! Strange things are picked up in Peter's sample recording, he sees things, and the basement evokes overwhelming feelings of sadness. While I did like the story, it did not give me the thrills and chills that I was hoping to get from a haunted house story. For me, this was a bit tame. It reminded me of those Goosebumps stories that my kids read. I was hoping for something a little darker and scarier. 3 stars!! It was good, and I enjoyed it. 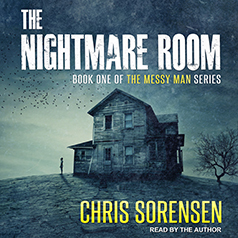 Thanks again to Tantor Audio for the opportunity to review this audiobook!